A proposal to increase local sales taxes to fund a county-wide bus system is in the hands of Okanogan County voters. The Okanogan County Transit Authority (OCTA) includes Okanogan County except some southeastern precincts and the Town of Nespelem. The concept for a county-wide bus system has been developed over the past year by a committee comprised of government leaders from cities and towns in the county, including representatives of Twisp and Winthrop. The transit plan calls for a “hub-and-spoke” bus system with a hub in the central Omak/Okanogan area and radial connections (spokes) to and from other primary incorporated cities and towns throughout most parts of the county. A principal goal of the bus system is providing access to employment, commerce, and medical, educational and government services. Bus service would be phased in, with routes to the Methow Valley beginning in 2015, according to the transit plan. Buses would travel between the transit hub in Omak to Twisp and Winthrop six times a day, five days per week. Another route would serve Winthrop, Twisp and Pateros four times a day, five days per week. Winthrop Mayor Dave Acheson, who represents Winthrop on the OCTA board of directors, sees bus service as a significant benefit to Methow Valley residents. “I think it will be a big boost for the valley as far as people being able to access services in Omak, allowing the valley to have a connection outside the valley, with Pateros and Omak. Those are things that don’t exist now,” Acheson said. “One of reasons I’m really in support of this is if you look at studies across the country, one of the biggest factors in people being able to improve their lot in life is access to transportation. It allows them to access to training, other job opportunities,” Acheson said. 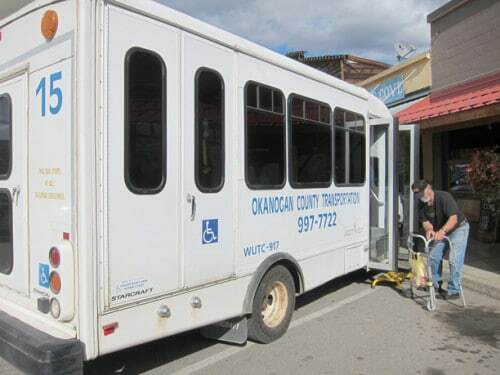 Okanogan County is currently served by Okanogan County Transportation and Nutrition (OCTN), a nonprofit organization, sometimes known as the “senior bus,” with a fleet of 13 buses supported through local and state grants. A survey of county residents last year found that one in four people was unaware of OCTN. OCTN serves the Methow Valley three days a week, with door-to-door service used primarily by elderly and disabled passengers. OCTN’s routes are irregular and tend to change based on available funding. This year OCTN is facing a budget crisis because federal funding cutbacks required by sequestration has reduced funds the organization received previously, leaving OCTN short on funds to continue operating through the end of the year. If voters approve the sales tax this fall for a new public transit system, OCTN’s door-to-door service would be expanded in days and frequency “to more adequately serve the needs of the elderly and disabled,” according to the transit plan. The new transit district would also investigate the possibility of contracting with OCTN to use its buses, Acheson said. The transit district proposition doesn’t appear to have any organized opposition, but it doesn’t appear to have garnered much attention either. “My experience is people don’t know much about it at all,” said Winthrop resident Elan Elenger, who was recently hired to promote the transit sales tax proposition by Transportation Choices Coalition, a Seattle-based nonprofit that advocates for public transportation throughout Washington. 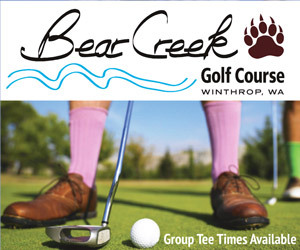 As part of the effort to get the word out, a website and Facebook page have been created. The final plan outlining the proposed bus system is posted on the website, www.getonthebuso kanogan.wordpress.com. Acheson said funding the transit system through sales taxes offers the advantage of generating revenue from purchases made by visitors to Okanogan County, Acheson said. “It’s especially true in the Methow Valley, that it will be paid for largely by people outside the area,” he said. A sales tax of four-tenths of 1 percent is expected to generate slightly over $2 million for the transit fund annually, and would be dedicated solely to funding public transit. The sales tax increase would not affect existing tax-exempt purchases, such as food or prescription drugs, rent and housing payments and utilities. The four-tenths of 1 percent figure was chosen partly because it was advocated by representatives of the Methow Valley, including Acheson and former Twisp Town Council member Clay Hill. Any amount less than that would not generate enough revenue to include service to the Methow Valley. OCTA would pursue grants to purchase buses, anticipating securing about $1.6 million in grants during the first two years to build its fleet, according to the transit plan. Planners of the system considered the choice between charging fares to passengers or developing a fare-free system. The final plan did not come to a conclusion, but indicated that if fares are charged they should be “relatively nominal,” with local service fares of 50 cents to $1, and higher inter-city or express fares. If voters approve the ballot measure, one of the first acts of the OCTA board of directors will be to hire a manager for the transit system, Acheson said. The nine-member board includes eight representatives of cities and towns and one county commissioner.